The HiLow Activator gives a reversal signal when the bar closes below the low average in an uptrend or above the high average in a downtrend. The HiLo Activator should be used in conjunction with other indicators. The HiLo Activator was introduced by Robert Krausz with his FibonacciTrader and first described by him in “The New Gann Swing Chartist”, which was published in the TASC magazine (Stocks & Commodities V16:2, pp 57-66) in 1998. The original HiLo Activator was a three day simple moving average calculated from the daily highs and the daily lows. This version may be used for intra day trading, either as a trailing stop, or as a trend filter. Rather than simply taking a three day simple moving average of the daily highs and lows, the indicator allows you to choose from 30 different averages. 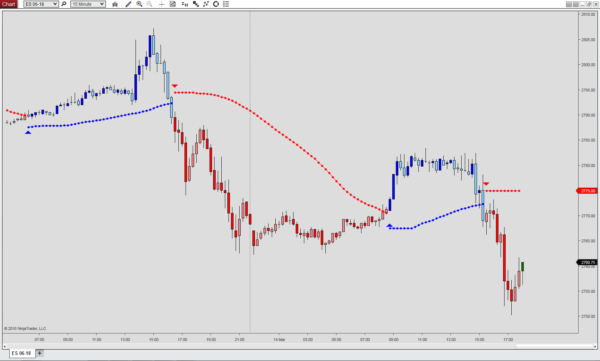 Furthermore, the HiLo Activator allows you to work with, displaced moving averages. Therefore, the trailing stop does not have to be recalculated with each tick (improving CPU efficiency). – A close breaks the trailing stop level (default setting). A trend change will then plot after the bar closes. – The first tick breaks the trailing stop level (reverse intra-bar). A trend change will then plot immediately and two trailing stop levels will be visible simultaneously. The HiLo Activator will also display the trend via paint-bars. Down-close bars are filled, up-close bars are hollow. For the up-close bars an opacity can be selected for better visibility.